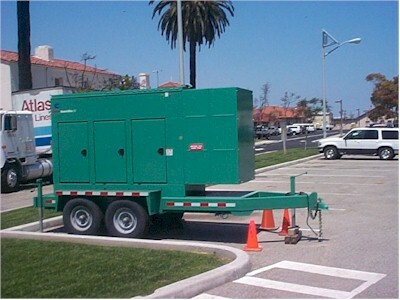 We spent the day at Los Angeles Air Force Base today, looking at stuff like this, an emergency backup generator. We're doing an air emissions inventory there and this is one of their permitted sources. That means the South Coast Air Quality Management District is interested in how much smoke comes out of it. The generator is powered by a 277-horsepower engine which runs on diesel fuel. Scientists have found that the combustion products of diesel fuel are rather toxic, so it limits the operation of engines like these to just a few hours per year for testing and maintenance purposes, unless there's an actual emergency, in which case it could run a bit longer.